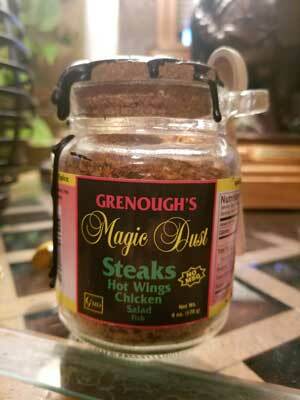 Grenough's Magic Dust will enhance the flavor of all meats you put it on, including beef, pork, chicken, fish and stir-fry's. Dust it on thick for a Cajun effect or simply season to taste to bring life back to all your cooking or grilling items. 100% guaranteed or your money back. Mark Grenough, CEO. EST 2001. Magic Dust is a unique blend of spice's never before used grilling spice and dry rub. Spice up your cooking to enhance the flavor. You will truly be amazed at the flavor of this grilling spice dry rub and cooking marinade. Enhanced the flavor of chicken, pork, fish, stir-fry's, hot wings and much more! As the years passed by, my friends, family, and co-workers continued to request my spice for their personal use. On several occasions I was told to market my spice that was only used in the meat market at the time. My friends and family, and customers said they had never tasted such a unique blend of spice and fell in love with it! Two years later we were on the market and bringing my dry-rub to your kitchen table. We now ship it all over the world. Grenough's Magic Dust dry rub and grilling spice. The last spice you will ever buy!